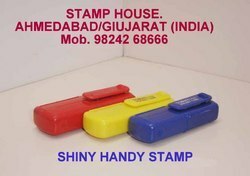 We are a leading Manufacturer of shiny handy stamp from Ahmedabad, India. A patented device for mobility, unique mechanisms design for operations to be easily made by one hand. Only 1/4 size of an ordinary, perfect to carry around.